Passed away peacefully on Thursday, April 11, 2019 at the age of 86. Beloved husband of Jean d’arc Saliba. Proud father of Margo (Youssef Nehme), Pierre (Grace Attieh), Sami (Siham Boulous), Feryale (Georges Ghossein) and Danny (Josianne Al Hourani), all of Gatineau QC and Houda (Toni Rizk) of Lebanon. Cherished grandfather of sixteen grandchildren and seven Great-Grandchildren. He will be dearly missed by his many nephews, nieces and by many families and friends in Ottawa and Lebanon. The family will receive relatives and friends on Friday, April 12, 2019 from 5:00 to 9:00 pm at Beechwood, Funeral, Cemetery and Cremation Services, 280 Beechwood Avenue. 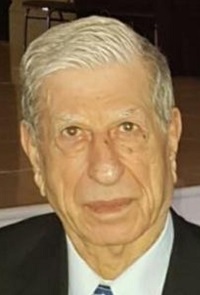 Funeral service will be held on Saturday, April 13, 2019 at 11:00 am at Saint Charbel Parish, Ottawa, Maronite Catholic Church, 245 Donald St. In memoriam, donations to Saint Charbel Parish Ottawa, would be appreciated.